Which state has the highest share of people who walk to work? It’s not temperate California. Actually, Alaska, the coldest state in the U.S., has the highest rate of active commuting. About 8 percent of workers there commute by foot and another 1 percent by bike. That illustrates something that researchers have noticed for a long time — climate isn’t a strong indicator of where people walk and bike a lot, or where they do not. In its big biannual benchmarking report, the Alliance for Biking and Walking cross-referenced climate data from the National Oceanic and Atmospheric Administration with walk and bike commutes rates in U.S. cities. They found only a “weak relationship” between climate and active commuting. The top chart shows major American cities on a spectrum from the most cold-weather days to the fewest. Note that biking and walking rates are scattered all over the place, even as the cities grow colder from left to right. When you look at cities that have lots of hot days, though, a relationship does appear. As this chart shows, some of the cities with the lowest bike and walk commuting rates also have some of the hottest days — Forth Worth, Jacksonville, Las Vegas. While there is a link between hot weather and lower rates of biking and walking activity, it doesn’t seem to be especially strong. This relationship is fairly obvious, and causality probably runs both ways. “Those who walk or bicycle a lot are less likely to need or want a car, and those who do not own a car are more likely to need to walk or bicycle for some trips,” the Alliance writes. Forth Worth, Jacksonville, Las Vegas are all very suburban in nature correct? Was the built form of the cities taken into account. There’s been a general movement from the colder northern cities to warmer southern cities over the past 50 years, at the same time that city-building practices have changed to privilege the car versus other modes. So newer cities are going to have less walking and bicycling regardless of climate. They might want to control for walkability before they jump to conclusions. Northern cities tend to be much more walkable to begin with so it seems logical that more people walk there. Youre all right, they arent controlling for the built form, but thats kind of the point isnt it? The built form can get people to walk and bike, even if its cold out sometimes. 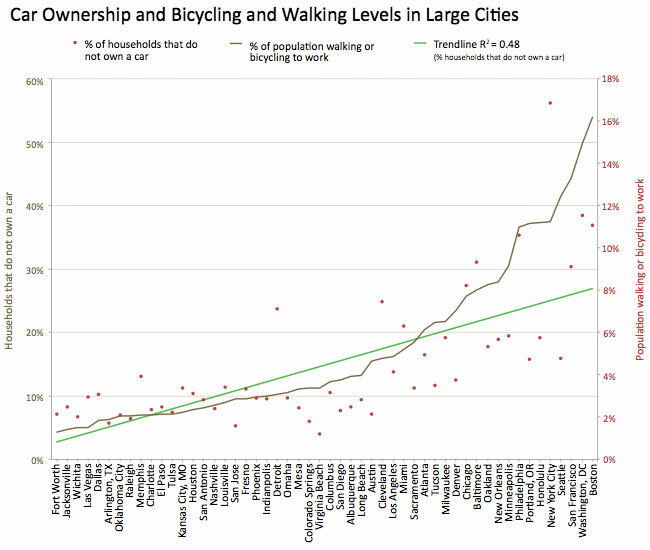 1) NYC, DC, and Boston seem too low on the walking/biking rates. This doesn’t include transit trips with walking/biking from origin and/or to destination? Other older, colder cities with transit would also have higher walking rates, and a stronger correlation. 2) Comments below seem to confirm that there is also a negative correlation between walking/biking+sprawl+hot days. Many of the hot cities weren’t settled significantly until air conditioning, which coincidentally came at roughly the same time as suburbanization.